Description: Amusement park ride called the Zipper is set up outside Chance Manufacturing Company plant, 4219 West Irving. View is looking north over Kellogg Avenue toward K-Mart and Long-Bell Lumber Company. Keywords: Wichita, business and industry, arts and entertainment, sports and recreation. 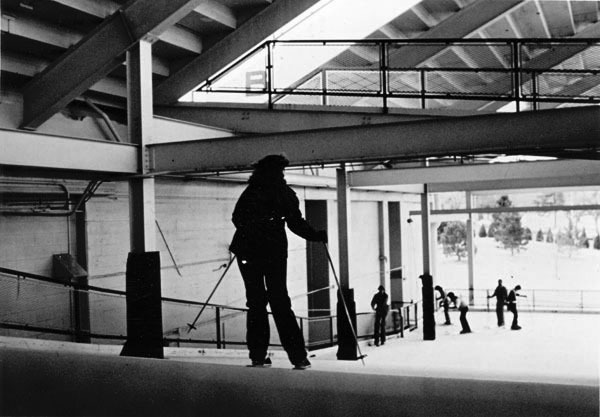 Description: Skiers make their way down "Shocker Mountain" ski slope at Wichita State University's Cessna Stadium. Ramps on west side of stadium were covered with slick plastic bristles. Program ran from 1977 to 1986. Keywords: Wichita, sports and recreation, education. Description: View of indoor swimming pool at the Holiday Inn Midtown, 1000 North Broadway. The motel opened in 1963, and the pool was enclosed in the early 1980s. Keywords: Wichita, business and industry, sports and recreation. Description: View looking north toward Wichita Greyhound Park main building. Located north of Wichita at 77th Street North and Interstate 135 just south of the Kansas Coliseum, race track opened in September 1989. Keywords: Wichita, sports and recreation, arts and entertainment, buildings. Description: Aerial view looking southeast toward downtown. Ralph Wulz Tennis Center, Wichita Art Museum and Wichita Water Works building in foreground. Downtown business district beyond confluence of Little Arkansas River and Arkansas River. Seneca Street bridge adjacent to Mid-America All-Indian Center under construction. Intersection of Seneca Street, Central Avenue and Stackman Drive at center. Keywords: Wichita, aerials, bridges, buildings, sports and recreation, libraries and museums, public services. Description: View looking northeast toward Lawrence-Dumont Stadium and downtown Wichita. Built in 1934 as Civil Works Administration project, baseball stadium has been expanded and renovated over the years. Farm Credit Bank building, City Hall, Epic Center, Century II Convention Center and Hyatt Hotel among prominent buildings in downtown business district. Keywords: Wichita, aerials, sports and recreation, rivers, bridges, buildings.